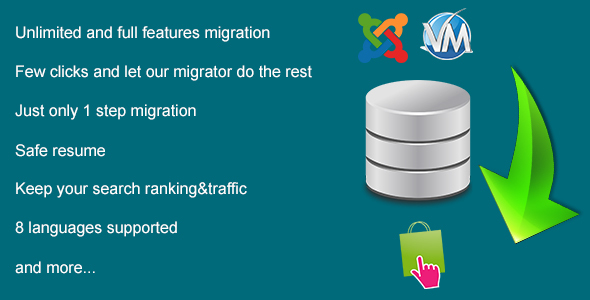 Database Migration from Virtuemart to Prestashop. Helpful tool to move all kinds of data to a new Prestashop ecommerce sites. According to our latest survey on over 1500 ecommerce websites whose content is managed by Virtuemart system, we come to a conclusion that over 62% complained about too many new updates available for Virtuemart which causes trouble for them to follow and update their sites. Besides, 44% of these websites owners would like to change their CMS from Virtuemart to Prestashop. Product name. Product short description. Product description. Link rewrite. Meta description. Meta keywords. Meta title. Base price. Sale price. Product width, height, lenght, weight. Date created. Product images. Category name. Category description. Link rewrite. Meta description. Meta keywords. Meta title. Date created. Company name. First name. Last name. Email. Password. Security key. Address 1. Address 2. Zipcode. City. Phone. Date created. Order number. Order status. Payment method. Order total. Order toal before tax. Products total. Shipment fee. Date created. Delivery date. Product items. Currency name. ISO code. ISO code number. Symbol. Conversion rate. Coupon name. Coupon code. Apply date. End date. Apply minimum. Percent discount. Amount discount. Date created.